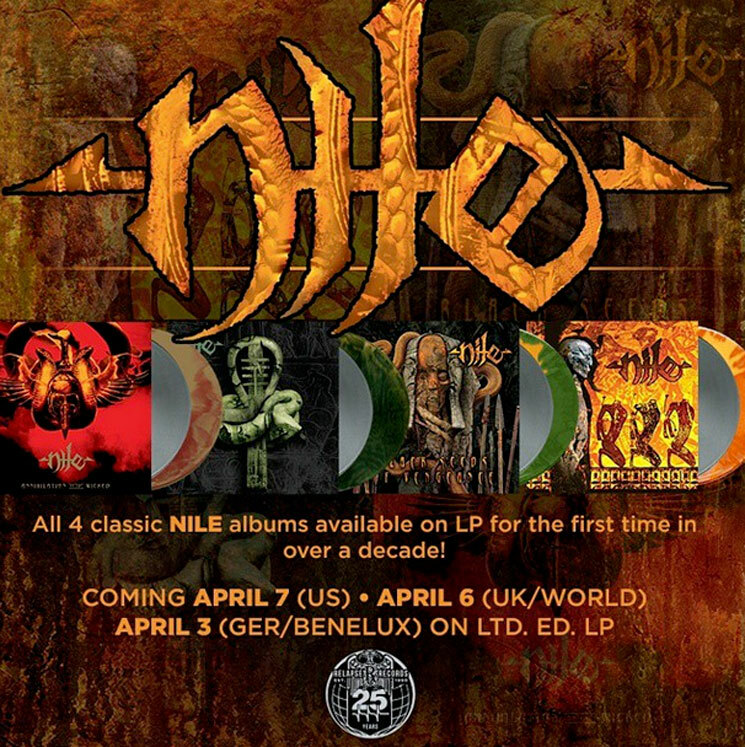 As part of Relapse Records' massive 25th anniversary celebrations, the metal label has announced that its ongoing reissue series will be blessed with vinyl represses of all of Nile's LPs for the imprint. Relapse announced the upcoming reissues today (February 11) over Instagram, confirming that on April 7 it will deliver fresh presses of 1998's Amongst the Catacombs of Nephren-Ka, 2000's Black Seeds of Vengeance, 2002's In Their Darkened Shrines and 2005's Annihilation of the Wicked. A domestic vinyl version of Amongst the Catacombs of Nephren-Ka was released through Relapse in 2006, having previously existed as a European import. The remaining records haven't been pressed up on wax since their initial release. Each album will be delivered on limited-edition silver vinyl, reflecting Relapse's 25th anniversary, but will also be preserved on their own colour variants. You'll find out all the pressing info, as well as details on bundles including T-shirts and stickers, over here. While the handful of reissues are on their way, Nile haven't delivered a new album since 2012's Exclaim!-approved At the Gate of Sethu.